Minorities • Top Pun's Poetry, Funny Political Puns, Free Posters! POSTER: Partisan Man – Senator Rob Portman – Mitch McConnell Made Me Do It! Country Club Jesus speaks to us in many ways. 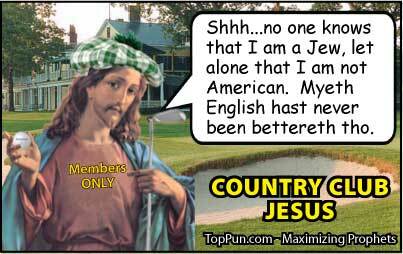 Ironically, Country Club Jesus, perhaps soon to be an American icon (lol), is neither American, nor speaks English. Even more shocking, is that Jesus was a Jew. Of course, this week’s comic touches on all three of these issues. Hearkening back to the days when country clubs simply did not accept non-whites or non-Christians, the revelation of Jesus’ Jewishness would be better kept as a secret, and better to let people assume that the Christ is in fact a Christian. Returning to current day America, with a new brand of xenophobia, suspicions of the need to exclude would probably center more around Jesus as a Middle Eastern man rather than a Jew. Profiling Middle Eastern men as potential terrorists it second nature in America today, and may even be classified as a national hobby/obsession. Notwithstanding, I’m most curious as to how the English-only crowd sees Jesus who in reality is a foreign speaking (Aramaic), well, foreigner. Even more oddly for the American English-only crowd, they seem to often have a fetish with the King James version of the Bible, which is hardly an American version of English, let alone modern-day British English, since it was completed in 1611. Sticking to such a version strikes me as an unwise balance between tradition and accessibility. I would argue that if the Bible cannot be translated into more accessible English, in the case of American English speakers, then there must be some fundamental disconnect between biblical truths and modern life (which I don’t believe to be true). I also find it incredibly ironic that one of the most popular version of the Bible was commissioned and given oversight by a monarch, a king. I find this ironic because I see Jesus as standing against worldly authorities, monarchies, and the like. But hey, I guess you’ve got to have a wealthy and powerful sponsor to get your message across. Maybe we should sell naming rights to the next version. How about the Wal-Mart Bible, or the Exxon Mobil Bible, or the Bank of America Bible, the McDonald’s Bible, or the J.P. Morgan Chase Bible? So, until next Sunday, with the next edition of Comedian Jesus, CEO Jesus, Country Club Jesus, etc., let me know what you think. This cool design is linked to a button, but other great Top Pun products like T-shirts, bumper stickers, mugs, caps, key chains, magnets, posters, and sticker sheets can be accessed by scrolling down the product page. View more Gay Political Buttons. This gay pride design is a classic that was popularized during the gay community’s struggle to combat HIV/AIDS in the 1980s and 1990s. There is a mode of being that is very common in life that if we just quietly get along everything will be alright. This may work much of the time. This definitely does not work all the time. While this design is specifically geared to the gay community, with its issues of coming out, speaking out, and dealing with all the crap that comes with that, this design and saying is universal for all of humanity. You might even say that breaking out of that common mode of just quietly getting along hoping that everything will be all right is what it means to be queer! And one queer reality is that we are all queer in one way or another. What I mean by this is that we are all minorities in one way or another. We are all disenfranchised in one way or another. We were all put down in one way or another, for who we are. It is out of this universal queer experience that speaking out becomes necessary. Silence is not enough. We need to communicate and assert who we are to others, particularly when who we are is different from others. Otherwise, who we are will never be adequately taken into account by others, that is by the majority or so-called norm for any social group. How could we expect otherwise? This is just the groundwork and footwork that needs to be done for us to live in community, which is inherently diverse, no matter how much we may try to homogenize things. Communicating who we are with one another is the only way that we can live together in a way that truly honors one another. Otherwise, while we may be technically living together, we are just in the same vicinity, living in our own little realities. Doing the hard work of speaking out and communicating with one another leads to a lot of disillusionment, that process of shedding our illusions. Unfortunately, I don’t believe that we have a choice in this matter. Living authentically, that is, in consonance with reality, demands that we learn about the reality of others and communicate our own reality to others. The difficulty in this is rooted in the fact that in those areas of our life where we experience fitting into the dominant norm, we have little built-in incentive to do the work of learning about minorities, those ways that others are queer. Thus, the incentive, or burden, falls to those who are in the minority, the queers. This will always be an uphill battle, with the less powerful doing their duty to inform the more powerful. Fortunately, acting in consonance with reality is ultimately the most powerful way of being. 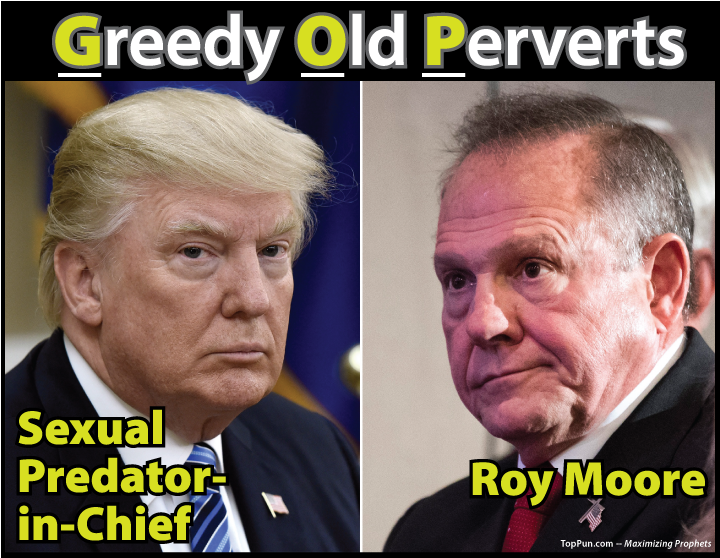 In this case, the less powerful are doing double duty by serving their own palpable interest and the less recognizable but equally important interests of those in a particular dominant norm. If this seems somehow unfair, please remember, again, that we all have areas in our life where we are living into the dominant norm, and we all have areas in our life where we are living into a queer norm. Thus, by recognizing this, there is a solid basis for compassion toward one another and ourselves. In this sense, we are all in the same boat. Normal is not normal. We are all queer. The seeming paradox of a queer norm is only paradoxical if we don’t recognize that we all experience one or another queer norm. It’s just a matter of doing the hard work of sorting out our experiences of difference, and truly appreciating that difference, diversity, is as valuable as it is inescapable. I do not believe that reality is cruel. There is a beneficence to reality that favors the beneficent. May we heed this reality and live into it joyfully whoever we may be. Let the process of self and other discovery continue!